The Nevada State Athletic Commission has medically suspended 10 “Strikeforce: Rockhold vs. Jardine” athletes for various injuries sustained in their respective scraps this past Saturday. 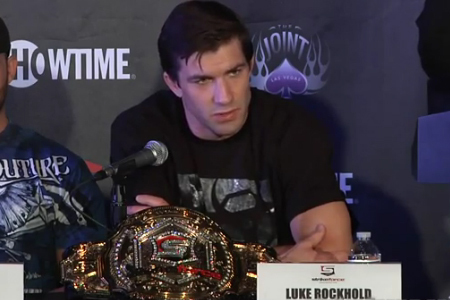 Middleweight champion Luke Rockhold (Pictured), Tarec Saffiedine, Tyler Stinson and James Terry could be riding the pine for up to six months, but can return to action sooner with a doctor’s note. The Joint at Hard Rock Hotel & Casino in Las Vegas hosted this past weekend’s show.